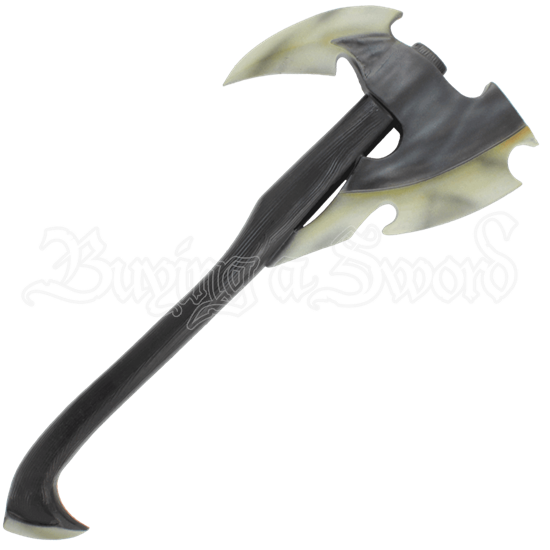 Dark elves are particularly known for their cunning and their viciousness, and both qualities are represented perfectly in this Dark Elven LARP Axe. This weapon combines a shorter haft with a brutal axe-head, making it a deadly weapon to have on-hand. The blade of this weapon is rather cruel in its appearance. Echoing the shape of a typical bearded axe, this weapon has an elongated blade that curves down, and unlike its counterparts, its beard actually presses against the hilt. The blade is decoratively notched in two places, which makes the cutting edge look more than just effective. It looks down-right painful. The reverse side of the axes head features a broad, curved spike that is perfect for hooking armor and delivering a wicked back-swing. The haft of the axe has a simulated wood grain finish, as well as a shaped curve at the bottom. Luckily, this axes dangerous appearance is tempered by its construction, in which LARP safe materials are used. It is crafted from an extremely durable foam that does not shred, which has been sealed within a strong coating of latex. As safety is always a concern in LARP, this weapon possesses a round, flexible fiberglass core that bends and flexes. The core also features a durable Kevlar cap for added protection, both against the core and for when the weapon is used to stab. The Dark Elven LARP Axe has an overall length of approximately 24 inches. Please be aware that this measurement can vary slightly, as it is a hand-made item.